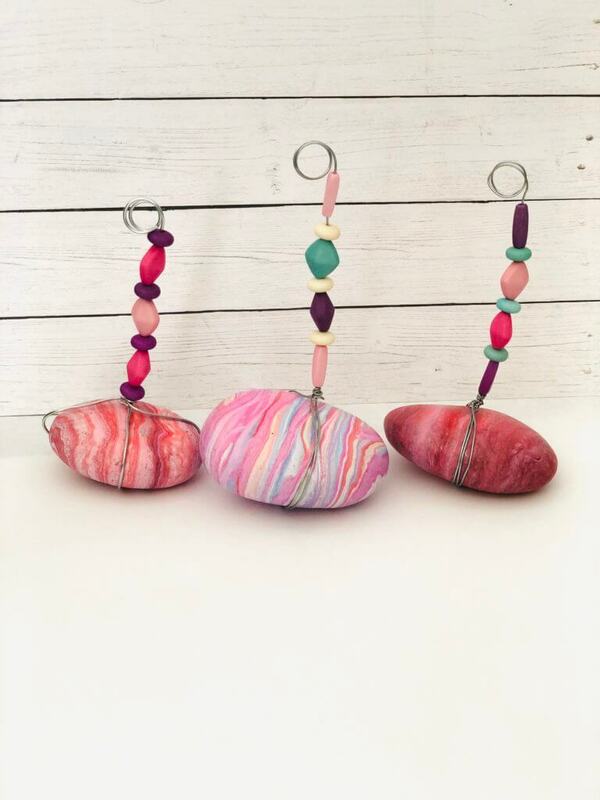 It’s time to flex your creative muscles and try these beautiful marbled stone photo holders. I’m a mom of two boys and sometimes I crave very cute pink crafts! Since Target has decided for me that it’s time to start thinking about Valentine’s Day. I thought I would take this opportunity to let my pink frilly flag fly! If you have the need to try something a little more creative and pretty, this craft is a must! Do your kids have a Valentine’s party upcoming at school? 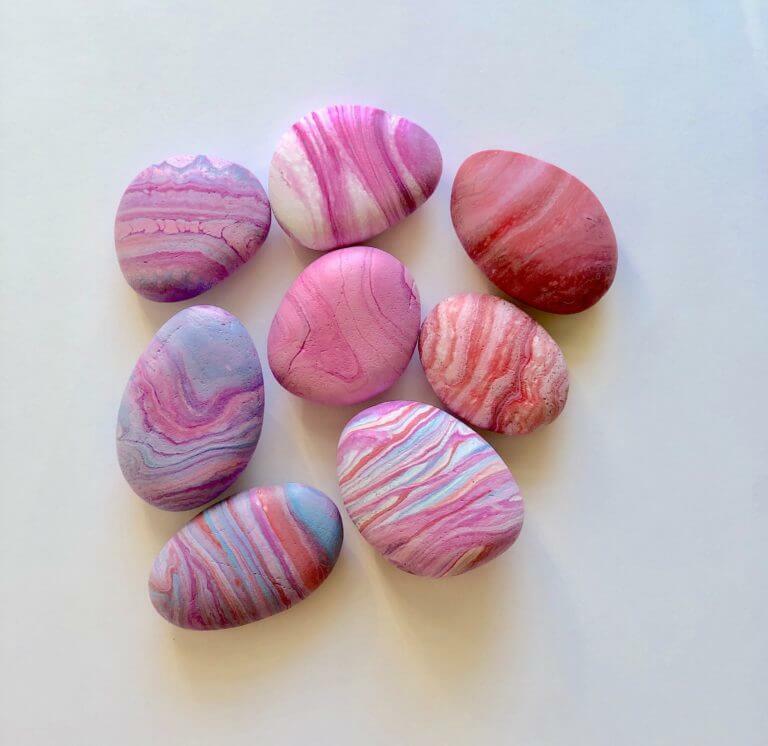 If so, these easy marbled stone photo holders could be an adorable Valentine gift to a teacher and/or classmates. 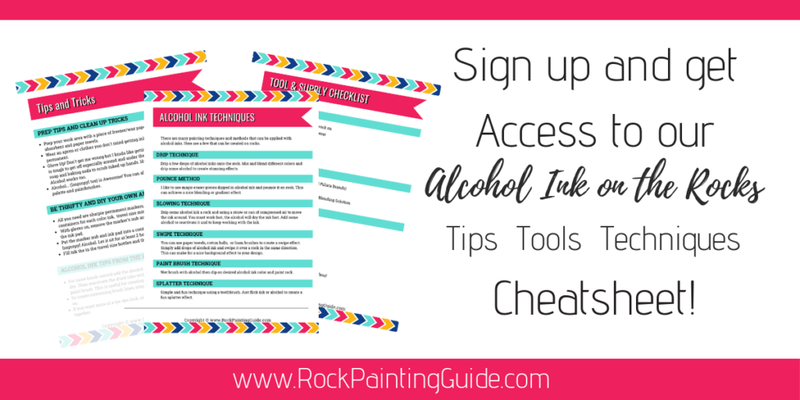 Is rock painting the one craft that you haven’t tackled yet? Well, here are some tips on how to get started. 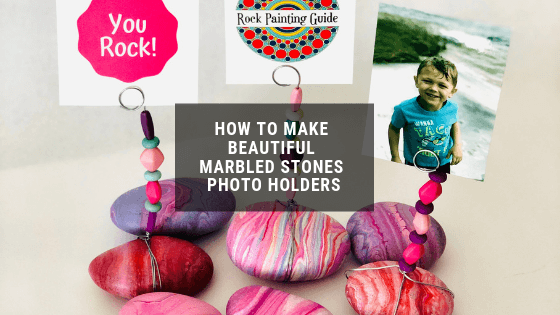 In this tutorial, you will find an easy step by step video on how I made these beautifully marbled stone photo holders. I tried a painting method that I have falling in love with and that’s acrylic pouring on rocks. 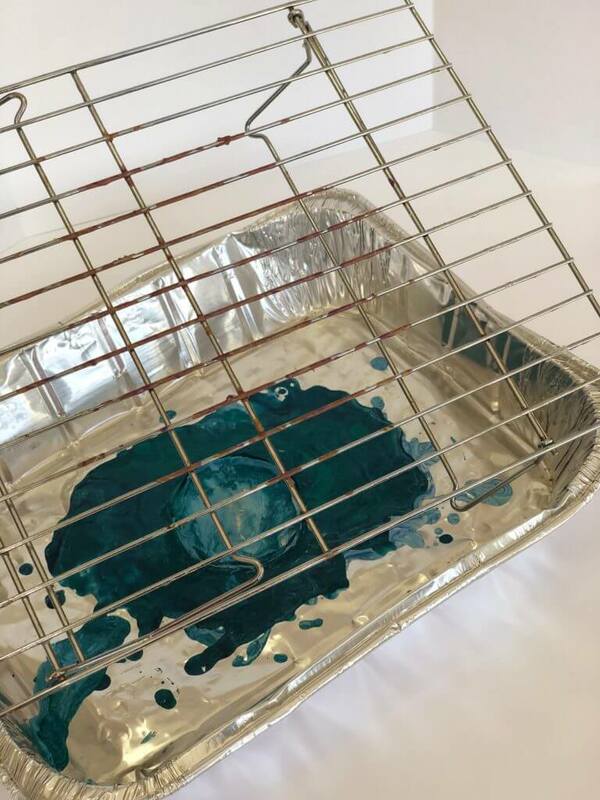 Gather all the acrylic paint pouring supplies before starting, this makes everything go smoothly before prepping the paint. Have a clean workspace where you can prep, create, and leave the rocks to dry without moving them. I recommend using a cooling rack and a disposable container to work in. Here’s a quick DIY paint pouring rack and pan for those one and done projects. When prepping your area, cover your table to protect it from paint drips. I used a large poster board or cut up a garbage bag to lay out. I like to use a 2:1 paint formula for my rock painting projects. Two-parts floetrol or a similar pouring medium to one-part acrylic paint. I prefer my paint to have a thin consistency, so when the paint and floetrol are mixed together the paint to glide of the craft stick in a stream. 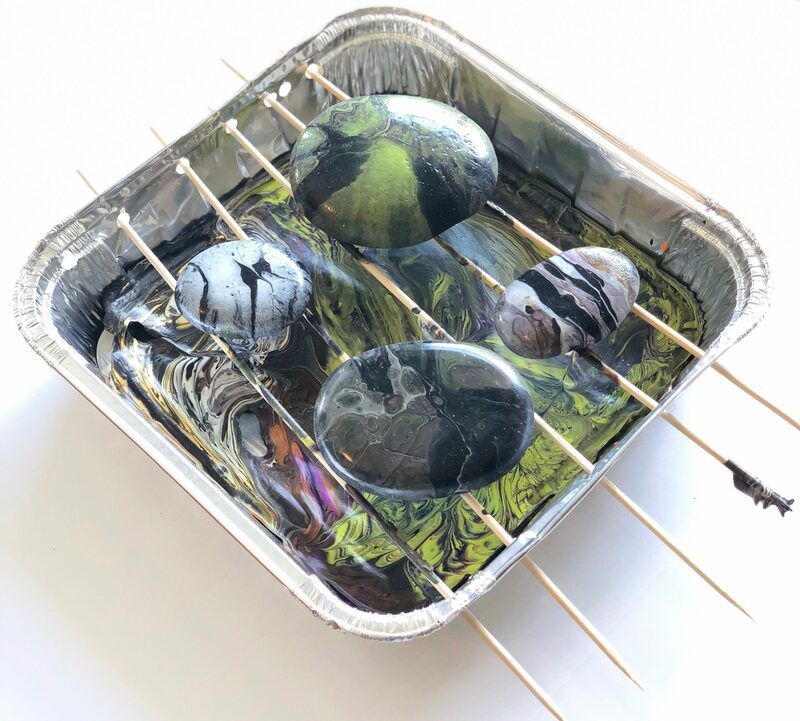 This method is a great way to paint a lot of rocks at one time for those big craft projects! Check out the easy step-by-step video tutorial below! 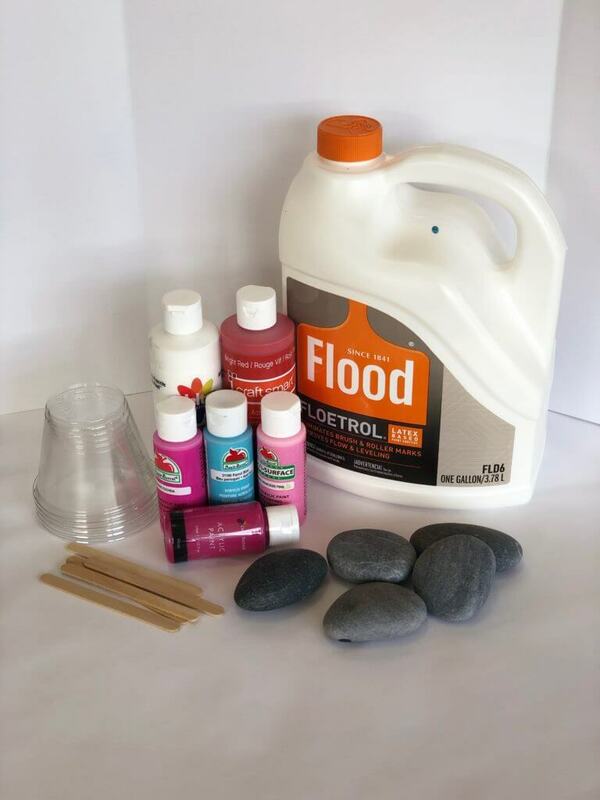 Here’s a list of what you’ll need for this craft project. Place your clean rocks on the cooling rack inside a container. Start preparing your paint cups. 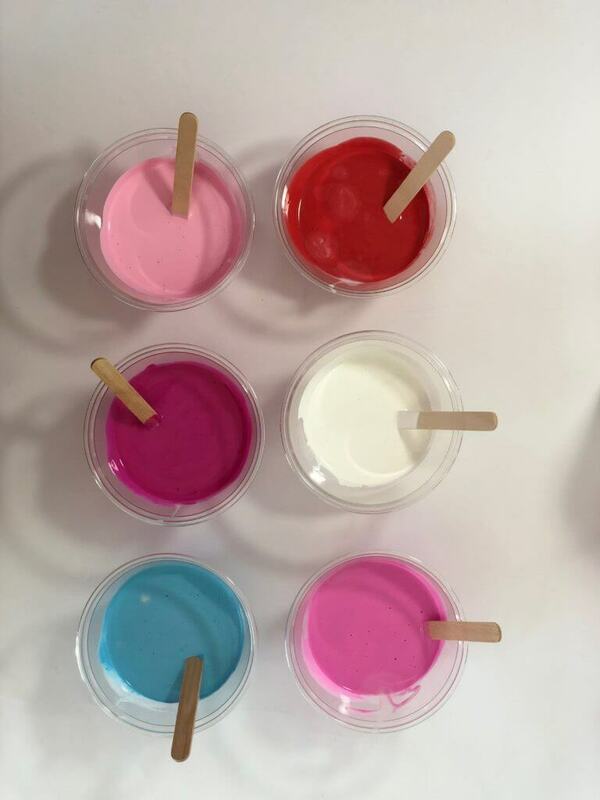 Choose the colors you want to work with and pour each color in its own cup. Mix in the pouring medium and stir with a craft stick. 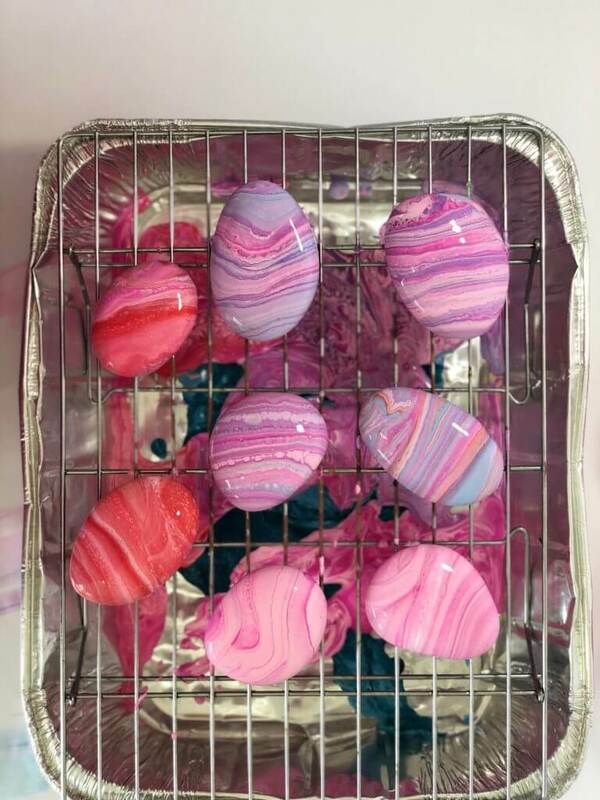 I used a red, white, bright blue, and three shades of pink paint color for these cute rocks. Making the Dirty Pour. Start pouring the paint into small amounts creating a layering effect with the desired colors. I made 4 cups of dirty pours to get different looks. Begin pouring the Dirty Pour over the rock slowly in your desired pattern to cover the entire rock. Let the rocks dry for at least 24 hours or more depending on where you are in the world. Humidity tends to make the drying time longer. Use a clear sealer on the rocks to protect from nicks and scratches and outside elements. Now the rocks are absolutely beautiful, but to put the icing on the cake we are going to make these beauties into photo holders! Cut a piece of craft wire about 22 inches (depending on the size of your rocks). Take a marker or pen and wrap one end of the wire around the marker twice. Use the needle nose pliers to pinch the end loop tight. Grab those beads and start stringing the wire to the desired length. Wrap the wire around the rock at least twice tightly. Then wrap it around the photo holder stem and cut the wire. Use the needle nose pliers to wrap the end of the wire around the photo stem so it’s not sticking out. Add your favorite photo or Valentine’s card and give to someone special. I hope you enjoyed this sweet rock craft. See these helpful post on Easy Valentine’s Day Rock Painting Crafts Roundup and Valentine Glitter Rocks for more inspiration.